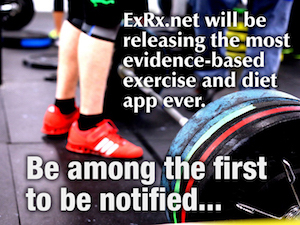 Any chance you'll be adding Pendlay Rows and One Arm Barbell Rows anytime soon? I'm writing a blog post and may go back in to add such GIF's in the future. The Pendlay Row is a strict Barbell Bent-over Row with the torso positioned horizontally. Interesting, I was doing the Pendlay Row before Pendlay even touched a weight. Glenn Pendlay and I went to the same High School (McPherson High School) and college (Kansas State University). He was a few years my junior. He later explained to me that he was describing to someone how to do a strict bent-over row and then sometime later people began referring to the form he had described as the 'Pendlay Row'. He said he initially tried to correct people in thinking it was an exercise that he had devised, but later gave up after he realized he was wasting his breath, and the name stuck. The version Pendlay advocated, where the torso remains horizontal, is how I learned to do it from the books of the day [eg: Schwarzenegger A, Hall DK (1977). Arnold: The Education of a Bodybuilder, pg 214]. It's certainly possible that Pendlay could have learned how to perform the bent-over row with this strict form from others at our local gym that I had previously instructed since as a 17-year-old, I created, promoted, and taught the first weight training classes at the McPherson YMCA where Pendlay also trained. The barbell row you commonly see today is a bastardized versions of the strict horizontal torso positioning, shown as ‘Rowing with Bar - bent-over position’ in Schwarzenegger’s book. When attempting to handle too much weight, it’s tempting to compromise form by positioning the torso more upright. Much more weight can be used when you're not bent over all the way but the range of motion is significantly compromised particularly with an underhand grip. What likely used to be compromised form with the torso angled up slightly has presumably morphed into an exercise with the torso nearly upright with an abbreviated range of motion. Apparently, this altered form has become the norm. This becomes more evident when we see videos or pictures in magazines of famous bodybuilders performing the barbell row with massive weights just slightly bent over; then everyone thinks that is how the exercise should be performed. I'm guessing the one arm bent-over row you are referring to is with one end of an Olympic Barbell either attached to a lever (landmine) or propped in a corner? It's referred to as Lever One Arm Bent-over Row (plate loaded). My new gym does not have a low back machine that allows movement through the spine. I have tried the seated cable row as described on your site but my spine barely flexes just before the weight bottoms out. If you perform the exercise on standard low pulley cable instead of a dedicated seated cable row machine, you will need to find something flat [weight plate(s), aerobics step, etc] to place at the base of the frame to keep your feet from sliding forward. Alternatively, you can straddle a bench positioned in front of the low pulley cable. Some benches accommodate your feet to be positioned on the bench's base with your knees slightly bent.